The front lines of the fight over hydraulic fracturing -or “fracking” – are being drawn at the lowest political levels. Fracking involves detonating explosions deep underground and then pumping large volumes of chemical laced water at high pressure into these wells. More than 1,000 chemicals have already been identified as those commonly used in the drilling process. According to a Scientific American Report, as of June 2012, there were more than 680,000 fracking wells throughout the country. The International Energy Agency reports that by 2018, North America’s daily supply of oil will be 3.9 million barrels higher than it was in 2012. Attitudes towards fracking for natural gas are highly polarized in the U.S. On the one side, there are scientists and the environmentally concerned and on the other, there are business groups and the oil industry. Those who support fracking point to the economic and employment benefits as well as the issue of energy independence. Those who resist fracking say the limited benefits it offers are trumped by the civilization-ending threat posed by climate change. In addition to methane, fracking releases radioactivity and generates toxic fracturing fluids known as BTEX, which are found to have harmful effects on the nervous system as well as cause birth defects and cancer. In essence, the debate boils down to job creation and economic growth versus pollution and environmental risk. A large and growing pool of research makes the point that fracking is not clean energy, it is in fact a major environmental problem, in addition to putting significant quantities of greenhouse gases (GHGs) into the atmosphere, it contaminates huge amounts of increasingly scarce ground water resources. Due in large part to fracking, the U.S. is emerging as a global fossil leader which has important deleterious implications. Fracking is also known to cause earthquakes. 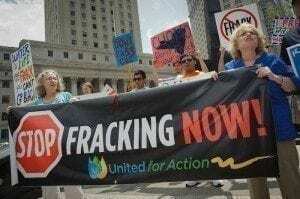 A British company official admitted that fracking in the UK has caused “a number of minor seismic events,” The U.S. Geological Survey has also made the connection between fracking and seismic events in the U.S., Canada and Japan. Natural gas is a large and growing part of American exports with many states reaping significant financial gains, this includes states like North Dakota, Pennsylvania, Colorado and Ohio. All across America, economic benefits are driving what can only be described as a fracking frenzy. While some states have outlawed fracking (eg New York, Vermont), other states like Illinois have enacted legislation welcoming the industry into their state. Right now, the U.S. Environmental Protection Agency (EPA) has no jurisdiction when it comes to fracking, thanks to a provision of the Safe Drinking Water Act known as the Haiburton Loophole—named after the first company licensed to practice fracking. Although previously cleared, in 2010, the EPA reopened its investigation into fracking. The EPA has pushed its timeline for release of its study assessing the impact of hydraulic fracturing from 2014 to 2016. This study was initiated by Congress in 2010 and was meant to provide guidance for states. Now that this research is off the table for the next few years, states will have to draw their own conclusions about the safety of fracking. This means that by the time EPA rules, there will be massive amounts of fracking chemicals in America’s groundwater and vast quantities of global warming causing methane emissions in our atmosphere. U.S. President Barack Obama sees fracking as a bridge fuel. While Obama does support fracking for natural gas, he has indicated that he wants to reduce the industry environmental impacts. While the Obama administration suggested that it would force oil companies to disclose the chemicals they use in the drilling process they are not required to reveal chemicals that are considered “trade secrets.” This is a glaring weakness that must be remedied with full disclosure. The President’s Climate Action Plan clearly states that, “Curbing methane emissions is critical to our overall effort to address global climate change.” However, his support for fracking does not acknowledge that methane is the chief GHG released into the atmosphere by fracking. “The natural gas boom has led to cleaner power and greater energy independence,” the President said in his 2013 State of the Union address. “That’s why my Administration will keep cutting red tape and speeding up new oil and gas permits. But I also want to work with this Congress to encourage the research and technology that helps natural gas burn even cleaner and protects our air and water.” The President said. While we may some some minor regulatory oversight, leadership on fracking will not be forthcoming from the federal government in the next few years. Independent of the political wrangling at the federal level, the fight against fracking will continue. In the absence of the President’s leadership and ahead of the EPA’s study in 2016, State governments are charged with the responsibility of regulating the fracking industry. The EPA has stepped back and allowed state government to assume oversight right across the country including Parker County, TX, and Dimock, PA.
Wyoming’s state government illustrates the problems associated with charging the states to regulate fracking. Wyoming appears to be whitewashing its investigating of fracking impacts in a development near Pavillion, WY. The state’s Republican governor Matt Mead has been accused of collusion with Encana, the company doing the drilling in that area. A growing number of people are getting involved and taking to the streets to protest against fracking. In New York, more than 3,000 people recently came together to send a message to Gov. Cuomo and state legislators demanding that they reject fracking and lead the nation in renewable energy. However, as demonstrated by Wyoming, state governments may not be the best place to combat fracking. In the absence of federal and state leadership, the fight over fracking is increasingly taking place at the regional and municipal levels. Even at the municipal level, fracking is a highly divisive issue. Boulder County in Colorado has enacted a new moratorium on fracking for 18 months and Dryden, New York, also upheld a ban. However, some municipalities are so hungry for jobs that they ignore environmental impacts. One such community is Youngstown, Ohio. which is a city that has been hit hard by the collapse of the steel industry. Even two earthquakes which measured 2.7 and 4.0 on the Richter scale did not deter voters from rejecting a proposal to ban hydraulic fracturing in the city. In Illinois Governor Quinn signed into law a statewide pro-fracking bill (SB1715). Despite the early mixed results at the local level, it is positive that the discussion about fracking is expanding. Being engaged in the discussion at the local level inspires people to get involved and encourages them to be better informed about the issues. One of the major roadblocks to local decision making on fracking is the fact that in many states, towns do not have the adequate legal authority to deny oil and gas companies. However, environmental lawyers, Helen and David Slottje, have figured out a way that towns might be able to use zoning rules to stop fracking. A May lawsuit in New York state upholds municipalities’ rights to decide zoning rules as they relate to fracking. Every day we are seeing more data pointing to the destructive impacts of fracking. NOAA studies show that methane emissions from natural gas development are much higher than commonly assumed. A recent report by U.S. military advisors also questions the value of fossil fuels including natural gas. A recent report from environmental consultant Jessica Ernst reviewed the contamination of North America’s groundwater sources resulting from fracking. Food & Water Europe and NGSFacts.com have also provided information revealing the dangers associated with fracking. While an ORC International survey, indicates that most Americans support domestic energy production, they are unwilling to sacrifice clean water, increased energy efficiency, and expanded power from renewable energy. It may be that the President is deferring federal action on fracking due to the political climate. In fairness, the President`s new Climate Action Plan does emphasize significant reductions in GHGs and strong support for renewable energy and efficiency. The President must choose his battles if he want to see them succeed. As the old cliche goes, “Rome was not built in a day” and this is particularly true if we are building for an enduring future and a truly sustainable economy. Even with the blight of fracking, President Obama`s action plan is moving the U.S. in the right direction. With the federal government abdicating its responsibilities, the fight against fracking is being waged at the municipal and state levels. To succeed in efforts to minimize fracking, we must not lose hope that the war will be won. We will bring an end to fracking one town at a time. Thanks for the well written article and for helping us better understand the issue. We also concur with the fact that we should not allow fracking to continue especially by companies who are merely seeking financial gain. Thanks from all of us at OMG. Every day we flush away tons of natural gas that we manufacture for free (methane from sewage). But rather than building bio-digesters, they want to use tons of water and toxic chemicals to flush gas from underground? ?